Teachers get good health benefits. Can we afford them? No one goes into teaching to get rich, but it's stable work and teacher benefits tend to be good, including health insurance. Non-salary benefits for teachers are a much-valued part of teacher compensation. They are also a complex area of public policy. What is included in teacher benefits? Who pays for health insurance for teachers? Can schools afford to pay for health insurance? Do teachers use their sick days? Most public school teachers are employed by school districts, which include health insurance in the benefits they offer their employees. These benefits are negotiated locally between districts and unions. Like all employers, school districts have struggled to sustain benefits in the face of spiraling health care costs. Most districts are small, and lack the power to negotiate good terms with health insurers on their own. Back in the day, many school districts provided teachers with lifetime health insurance for themselves and their families. Such benefits are now uncommon, though most provide health coverage until Medicare kicks in at age 65. 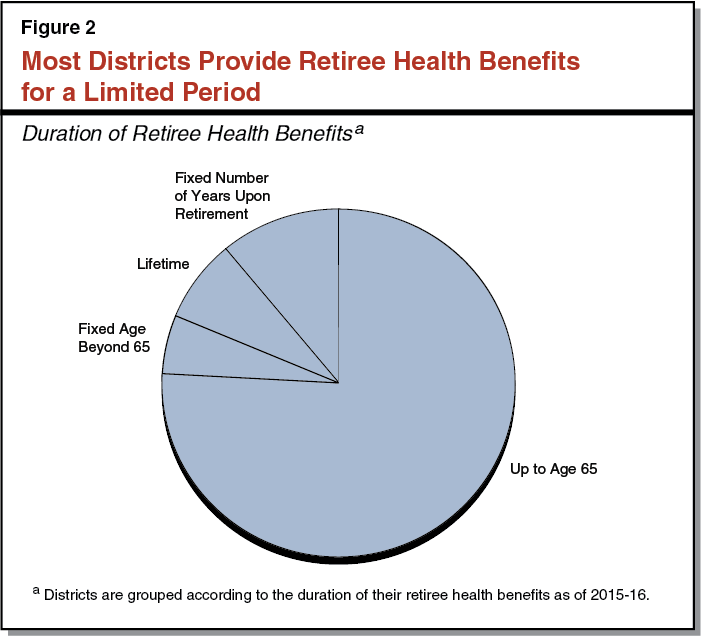 According to the California Legislative Analyst Office (LAO), "Adjusted for inflation, districts today are spending about twice as much on retiree health benefits as they did in the early 2000s. This added cost pressure comes at a time when districts are facing other pressures—most notably, rising pension costs and expectations to enhance services for low-income students and English learners." California taxpayers have a shared interest in the solvency of school districts. The obligation to provide public education is enshrined in the state constitution. This obligation is usually interpreted to mean that the State of California is ultimately on the hook for providing students with an education. The state delegates the authority to operate schools to school districts, but districts are expected to discharge that authority capably. For decades, California's school system had weak controls in place to account for long-term liabilities; districts could make long-term commitments that were poorly understood. The problem certainly afflicted school districts that agreed to contracts promising teachers long-term or lifetime health benefits, which are now placing school district budgets under tremendous stress. The problem is particularly large in Los Angeles, which carries an unfunded liability of about $27,000 per student, according to the California Legislative Analyst Office (LAO). As the old axiom goes, all debts are paid somehow. Liabilities incurred locally through district and union negotiations must fall within the means of the community, or the state can "take over," revoking the community's right to govern its own schools, invalidating employment contracts and bond commitments, and imposing financial obligations that can linger for a very long time. Oakland, Compton and Inglewood all stand as cautionary tales to school boards that can't or don't do their math. Los Angeles Unified faces serious challenges to bring its finances into balance. According to Chad Aldeman of Bellwether Education Partners "the district already is spending about $493 per pupil and $12,221 per teacher to provide former employees, their spouses, and dependents with free medical, dental, and vision coverage." And that doesn't even count the underfunded condition of the teacher pension system, which we take up in Lesson 3.11. Clearly, school districts need oversight to ensure that they don't make commitments that can break the bank. The job of evaluating district finances falls to County Offices of Education, which certify district budgets. In California, most County Superintendents of Education are elected, not appointed. Voters, understandably, tend to evaluate candidates for this office based on experience in educational leadership rather than financial and organizational experience. The state's Fiscal Crisis and Management Assistance Team (FCMAT) provides counties and districts with technical support, but mistakes do happen. Non-salary benefits are a critical part of "the deal" for teachers. Teaching used to pay pretty well relative to average wages for college graduates, but this advantage has evaporated, a topic we take up in the next lesson. It can be very hard for teachers to make ends meet, especially in the densely-populated areas of the state where property values are high. Districts do what they can to make the "deal" work out. For example, in some districts it is quite common for teachers to claim all of their "sick days" each year, not necessarily for reasons of illness. Tolerance of teacher absenteeism is not universal; the culture of each school and district determines whether "mental health breaks" are part of the "deal" or an abuse of the system. Do you know where to find the formal benefits policies for teachers in your district? It might be difficult to find. Check with your district office to find a copy of the current teacher's contract. Don't be shocked if it's a thick document! Individually, between districts and each individual teacher. Locally, between school districts and unions. At the state level, between each state and the unions. I have never unstood why using sick leave given to us is considered an abuse of the system. Don't give it, if you don't like the sick leave being used. According to the LAO report that Carol mentions above, the challenge is uniquely massive in LAUSD, which carries an unfunded liability of $26,929 per student for health care benefits the district has promised to its employees. The National Council on Teacher Quality (NCTQ) collected teacher contracts in major districts across the US to compare them. This study found significant differences among the agreements. It also found significant differences among districts in how strictly they enforce the terms. For example, in some districts it is customary for teachers to use all their "sick" days each year. Some contracts distinguish between "sick days" and "personal days." Some contracts permit teachers to "roll over" their sick days. Others even permit teachers to cash them out. Not because of benefits but because they love to teach. My benefits are not great. The retirement, at least in some states, is worth it. Teacher retirement systems are generally well designed. Benefits are available in most work environments. The added (unseen) benefit is the time off for holidays, summers, etc. It is a perfect profession for moms and dads who are passionate about teaching kids and yet also want a job that accommodates their families. Like many other educators in the country, I went into teaching not because of the strong health coverage benefits; I choose to stay in teaching because it's the most rewarding job in the world. I believe in order to attract talented and dedicated individuals into the teaching profession, we must offer them higher salaries and strong health coverage benefits. How Do Teachers Work Together? How Has Teacher Pay Changed? How Do Teachers Know If They Are Succeeding? Teacher Tenure - Good? Evil? There are no related lessons.